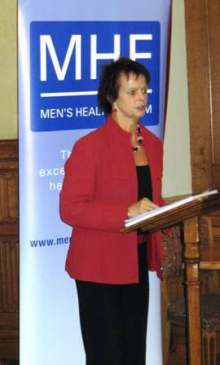 The All Party Parliamentary Group on Men's Health last month attracted parliamentarians and health campaigners to hear about the link between the biggest killer of men and conditions which many of us would rather not talk about. Cardiovascular disease (CVD) is responsible for 28% of premature deaths in men. Erectile dysfunction (ED) and testosterone deficiency syndrome (TDS, or hypogonadism) are also relatively common. ED affects at least one in ten men and TDS between one in 200 and one in ten men. But ED and TDS are not just sexual health problems. They are also potential indicators of serious underlying health conditions like Type 2 diabetes and cardiovascular disease. The reception was addressed by Anne Milton MP, the minister for public health, right, Dr Graham Jackson, a cardiologist and by the MHF's CEO Peter Baker. The minister spoke about the government's work on issues linked to heart disease such as smoking and alchohol. She also mentioned the potential of the internet for reaching men with health information but that there remains a danger from poor information and from buying counterfeit drugs online. Peter Baker emphasised that the problem with buying drugs online is not limited to the risks from the counterfeits themselves but also includes the risk of underlying conditions, such as heart disease, being missed if men bypass their GP. The Forum produced a briefing on these issues for the meeting and has produced a report following the meeting. The Men’s Health Forum’s work on this meeting was paid for through an unrestricted donation from Bayer Healthcare.